Indonesian Volcano eruptions increasing | Watts Up With That? Eruptions from Indonesia’s ferocious Mount Merapi keep getting worse, prompting more villagers to run for their lives and puzzling scientists trying to decipher Mother Nature’s plans. Hot ash clouds are sweeping across central Java, shooting up to six miles into the sky and snarling local air traffic. Today’s booming eruptions have been the strongest since Merapi—whose name means “Mountain of Fire” in Javanese—exploded on Oct. 26, volcanologist Kurniadi Rinekso told Agence France-Presse. Indonesian officials announced five more deaths from the suffocating lava and smoke, raising Merapi’s total death toll to at least 44, CNN reported. Nearly 75,000 people are huddled in evacuation shelters far from their livelihoods, and it doesn’t look as if they’ll be able to return home anytime soon. “It looks like we may be entering an even worse stage,” state volcanologist Surono told The Associated Press. After predicting earlier this week that eruptions would ease up, scientists are throwing up their hands as they are confronted today with eruptions three times stronger than expected. “We have no idea what’s happening now,” Surono said. Merapi’s ash prompted global concern today when a Qantas airliner suffered engine failure after takeoff from Singapore’s airport. The incident occurred several hundred miles away from Merapi, and officials say they’re still investigating, but it appears unlikely that volcanic ash could have affected the plane. The A380 managed an emergency landing back in Singapore, and no one was hurt. The latest eruptions have also been accompanied by tremors, a sign that energy is still pent up inside the volcano and unable to escape, the head of the Volcanic Technology Development and Research Center, Subandrio, told The Jakarta Post. “This can [also] be seen from the hot clouds that have been rising from the mountain’s peak,” he said. Indonesia’s island archipelago sits on the so-called Pacific Ring of Fire, where the world’s most volatile fault lines lie deep under the earth’s crust. Earthquakes and volcanoes are common there along the eastern and western Pacific rims. According to the Darwin VAAC, ground-based reports indicated an eruption from Merapi on 28 October. Cloud cover prevented satellite observations. CVGHM reported that two pyroclastic flows occurred on 30 October. According to a news article, ash fell in Yogyakarta, 30 km SSW, causing low visibility. CVGHM noted four pyroclastic flows the next day. On 1 November an eruption began mid-morning with a low-frequency earthquake and avalanches. About seven pyroclastic flows occurred during the next few hours, traveling SSE a maximum distance of 4 km. A gas-and-ash plume rose 1.5 km above the crater and drifted E and N. CVGHM recommended that evacuees from several communities within a 10-km radius should continue to stay in shelters or safe areas. The Darwin VAAC reported that a possible eruption on 1 November produced an ash plume that rose to an altitude of 6.1 km (20,000 ft) a.s.l., according to ground-based reports, analyses of satellite imagery, and web camera views. On 2 November an ash plume was seen in satellite imagery drifting 75 km N at an altitude of 6.1 km (20,000 ft) a.s.l. News outlets noted diversions and cancellations of flights in and out of the Solo (40 km E) and Yogyakarta airports. The Alert Level remained at 4 (on a scale of 1-4). CVGHM reported 26 pyroclastic flows on 2 November. A mid-day report on 3 November stated that 38 pyroclastic flows occurred during the first 12 hours of the day. An observer from the Kaliurang post saw 19 of those 38 flows travel 4 km S. Plumes from the pyroclastic flows rose 1.2 km, although dense fog made visual observations difficult. Ashfall was noted in some nearby areas. Geologic Summary. Merapi, one of Indonesia’s most active volcanoes, lies in one of the world’s most densely populated areas and dominates the landscape immediately N of the major city of Yogyakarta. The steep-sided modern Merapi edifice, its upper part unvegetated due to frequent eruptive activity, was constructed to the SW of an arcuate scarp cutting the eroded older Batulawang volcano. Pyroclastic flows and lahars accompanying growth and collapse of the steep-sided active summit lava dome have devastated cultivated and inhabited lands on the volcano’s western-to-southern flanks and caused many fatalities during historical time. The volcano is the object of extensive monitoring efforts by the Merapi Volcano Observatory (MVO). It’s too bad volcanoes are so deadly, because they’re so frickin’ cool. Is there enough going up 6kms to cause any significant ash-gas cover to spread out for any global cooling…or is it too small at present? Any takers! If the warmists claim they’ve recorded a reduction in ‘global average temperature’ (meaningless that it is) as a result of the emissions from this and other recent volcanoes, they will undoubtedly lobby their respective governments to increase funding of the projects to pollute the stratosphere with sulphur. We can hear it already …. “2010 would have been the warmist year ever … except for the volcanic eruption of mount excusus” … sorry merry pee. Wow! Could this be a BIG ONE we’re going to see? It’s going to kill a lot more than 44 people if it is. We’ll see what actually happens around the world if we get a “year without a summer” out of this, and my guess is that it wouldn’t be pretty. I’m going to be working in Indonesia in the New Year and will be flying from Jakarta east to Irian Jaya. If Merapi is still going I’ll get a good view! Ash cloud reported up to 16km according to Australian BoM advisory (Pinatubo topped out at 40km). Lots of SO2 since yesterday but probably not high enough to cool much. Fortunately the RSS and UAH temps have already started their decline. You can be certain that further declines will be blamed on this volcano. Expect to see the word “masked” attached to the word “warming,” over the next two years. If this does a Krakatoa or a Mt St Helens, this could interesting indeed. There would be a huge loss of life, probably bigger than the Boxing Day tsunami toll, but the ash ejecta into the stratosphere could also cause major disruption to the weather and I dobt anyone will be travelling by air much. Krakatoa gave spectacular sunsets for a year – that much ash is bound to hit air travel. I look forward to CRU’s building this into their models! I think perhaps the problem is that Mother Nature doesn’t make plans, she kinda goes with the flow. I think there’s something in that for all of us. The Australian summer, at least on the east coast, is not looking to be too hot this year. Last year was, mostly, a year without a summer too, according to the natives (As well as being the second summer without flys). There is a lot of activity around this side of the Rim of Fire however. ScienceDaily (Nov. 3, 2010) — Scientists have long known that large volcanic explosions can affect the weather by spewing particles that block solar energy and cool the air. Some suspect that extended “volcanic winters” from gigantic blowups helped kill off dinosaurs and Neanderthals. In the summer following Indonesia’s 1815 Tambora eruption, frost wrecked crops as far off as New England, and the 1991 blowout of the Philippines’ Mount Pinatubo lowered average global temperatures by 0.7 degrees F — enough to mask the effects of manmade greenhouse gases for a year or so. enough to mask the effects of manmade greenhouse gases for a year or so. Such methods reflect advocacy, not science. Actually, from a link I followed on an earlier topic post, the Indonesian govt is currently watching 40 volcanoes. Add to that Mt. Mt. Mayon in the Philippines, the one up in eastern Russia, and the trio in Alaska acting up…it could get interesting. An active volcano erupts and it “stumps” scientists? Is this real? An active volcano on the Rim of Fire? When Mt Ruhapeu erupted in New Zealand in 1995 I sure the hell wasn’t stumped when I found out it is a VERY active volcanic region. Where can I get a research grant, I can be “stumped” by anything but the bleeding obvious? Could the increasing pressure on the planets surface be causing an increase in eruptions? Or is it a case of same amount of eruptions, just some more close to populations? The AOL news story includes the phrase “suffocating lava”. If lava catches you, I don’t think you’re dying from suffocation. Now, if those silly Indonesian/Asian chaps & chapesses took a leaf out of the Union of Eurpoean Socialist Republics/Peoples Democratic Republic of the European Union book, the entire air space could be shut down for months on end if they used the right puter model!!!!!! Height of ash column is more to do with tropical cu-nim activity than eruption energy. Why so much billions are being spent on studying the (imaginary) effect of a few ppm increase in atmospheric CO2, which has never really killed anybody, but practically nothing is heard about the real killers…earthquakes, tsunamis and volcanic eruptions? The latest tsunami of two weeks ago killed hunderds of people, following the hundreds of thousands killed in the great Tsunami of Boxing day 2004. The only times humanity suffered was not during global warmings, (on the contrary, society flourished during such times) but during global coolings, be they due to geologic, solar or other activities. Possible global cooling due to these eruptions, added to the current solar inactivity and El Ninia……..brrrrrrrrrrrrrrr Any takers? I'm no expert, just asking… Anthony? Indonesian officials announced five more deaths from the suffocating lava and smoke, raising Merapi’s total death toll to at least 44, CNN reported. ABC News (US) just said on Good Morning America (about 7:15 AM EDT) it’s now revised to over a hundred. Not to make light of the situation, but will this interfere with the Presidential air armada as they go India and nearby places during the big tour? People are not dying because of global warming but because of global inaction and stupidity. I may be digressing from the issue here, but what can exceed the level of the UN's stupidity when it announces the creation of the post of Earth's ambassador for aliens..in case these exist and visit us for an afternoon coffee break. Quote:Mazlan Othman, a Malaysian astrophysicist, is set to be tasked with co-ordinating humanity’s response if and when extraterrestrials make contact. Too much Stephen Spielberg movies being shown inside the UN building maybe? I have a quick question for any vulcanologists who may be reading this; or indeed anyone with the relevant knowledge. Is there an index or a scale that measures the comparative energy output of volcanic eruptions, as there is for earthquakes? If so, how does Merapi measure up against such eruptions as Pinatubo, or Mount Saint Helens, or even monsters such as Krakatoa and Tambora? 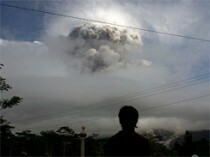 The Indonesian Volcanological department from reading there seismic charts are fearing a massive eruption. Each eruption is getting larger. The latest report issued by them indicates that between 0600 and 1400 5/11/10 there was continuous tremor, pyroclastic flows and explosions. They are recommending all residents to take safe cover further than the current exclusion zone of 20 kilometres radias. Indonesia has the largest amount of active volcanoes than any other country – there are always a couple on high alert. Nothing out of the ordinary. It’s just that Merapi is located in a high population zone. To influence weather patterns an eruption must send ejecta well up into the stratosphere 100,000+ feet and plenty of SO2 and dust with it. Last estimate of this Merapi eruption ejecta was .05 million Cubic kilometres although this figure has surely increased. By contrast Pinatubo was 10 cubic kilometres of ejecta and Tambora (1815) 100 cubic kilometres of ejecta. From what I have read this volcano usually erupts with a maximum VEI 3 (usually less). The, what is now Lake Toupo (Pronouced Toe-Pour, as best as I can represent), eruption in New Zealand drawfs these events by several mangintudes. It would seem that historically a quite sun tends to make our little planet somewhat angry. The reasons yet to be understood, our fading magnetism perhaps a part of it. I do feel that the next few decades will prove to be a water shed for the demise of AGW and the digging up of coal an expanding and necessary part of survival. Sad a little that my grand children may not perhaps enjoy the benign peace and climate that I have had the privilege of. It also saddens me that science has retreated into a shell and rejects all ideas outside the safety barrier of consensus. Strangely volcanoes are a molten plasma isolated from the earths inner molten mantle, a ball of energy agitated and made molten by the very same harmonics that are used for the detonation of atomic bombs. Thus the alignments and harmonics are predictable and the big bangs easily predictable, I can only imagine that the equations are supposed to be secret, thus people die for no good reason. Maybe one day humanitarian real scientists will step up to the plate and allow the plebs of the world an explanation as to why they are failing us. Where are the institutions of higher learning teaching the young the art of free thought, rather than the existing paradigm, the 20th century after great turmoil held such promise, frittered away and destroyed by a selfish generation of politically correct self serving elitists who believe only their world view and ideas are correct. Volcanoes and earth quakes may be the straw that broke the camels back. People are not dying because of global warming but because of global inaction and stupidity. Maybe a little reminder here that this eruption is not just a debating point but is affecting and taking many lives. My research shows that volcanic eruptions occur at solar forced temperature uplifts. Many of the largest historic eruptions have occurred on strong warming spurts following very cold winters. On this basis I have been successfully predicting times of new activity since 2008 at a weekly definition. admits this isn’t well understood either as “the models” all predicted patterns of reduced rainfall in areas effected by large volcanic eruptions – the sulfate particles reflect sunlight back into space lowering the surface temperature and hence lowering surface evaporation rate which means fewer clouds and fewer clouds mean less rainfall. In fact it does work that way in some areas but in others there is increased rainfall that the models do not predict. My guess is that other particulates, particularly ash and soot, form nucleation points for raindrops and hence cause more rain than less while the ash is resident in the atmosphere. Ash doesn’t usually persist for a long time unless the eruption is violent enough to drive it into the stratosphere where jet streams can spread it around the globe. Even so it’s eventually going to settle out of the stratosphere and potentially change rain patterns via water droplet formation around the increased number of particulates. Yes, that is clear, people are dying and being left homeless. Do not build your home near a volcano, on a fault line, beneath a steep mountain slope or in a flood plain. If you do then something will eventually occur that will do you serious damage. When that happens you should not expect others to see you as a victim since you chose to be part of the event. The big one, as far as human evolution is concerned, was Toba, c-70,000BC. The effects of that can still be traced in the human genetic markers. Not exactly. As much as it pains this American, we lost the battle in 1775. While we captured Montreal on the way to Quebec, we lost as Quebec when the American commander was killed early into the battle and the forces he led retreated. Benedict Arnold continued with Morgan but Arnold was injured and forced to retreat while Morgan and his forces, having made the deepest penetration, was forced to surrender. The French, being the French, played both sides. 😉 The Americans were able to mount a weak siege, but it was easily broken that spring. What part of Indonesia is Obama supposed to visit? Will that part of the trip be canceled due to ash in the air? India is having crews remove coconuts from trees so none of them fall on Obama. I can’t see taking Air Force One anywhere near an ash plume. Maybe he should just cancel the whole trip and save us some money and CO2. How does the current volcanism compare to Pinatubo? Triffin is referring to Dr. Erik Klemettis’s excellent blog on volcanoes. One of the commentators on his blog is Dr. Boris Behncke, who is a vulcanologist in Italy. He commented that this eruption is still much, much smaller then Pinatubo. I think the numbers he gave indicated that Pinatubo was more then 250X greater then Merapi, at least at the time he gave the comment on Wednesday. Of course that could change, but so far nothing about this eruption would indicate that it will have any impact on climate. Unfortunately it has had a tragic impact on the people living nearby. Someone mentioned Mt. St. Helens, which was a fairly large eruption, but again much smaller then Pinatubo, and did not have any effect on the climate. Eruptions VEI 4 or so happen several times every year, and usually do not make the news unless it has a major impact on people, such as a death toll like this volcano has had or impacts on air travel. This thing is going to go on for a couple of months. The total VEI of an eruption period is not calculated until the end of the eruption year. I sure notice more cloud cover. At least two plumes in Russia (Kliuchevskoi and Shiveluch) made stratosphere in October. When you think of all the carbon dioxide sinks (i.e. plants, carbonates, idiot scientists, etc) it is a very good thing that volcanoes are there to help replenish CO2 in the atmosphere. As we all know, without CO2 in the atmosphere there would not be life on earth. It is just too bad that people go built houses on them. Or maybe the problem is in anthropomorphizing natural forces. How does the amount of CO2 belched by volcanoes compare with the amount produced by man? If this eruption continues for months, or if it erupts in a huge way, will it show up in the Hawaii CO2 measurements? What would Mother Gaia say about your comment?? I have read that the tremors indicate that the magma chamber is filling up. Thank God San Francisco banned ‘Happy Meals’. Someone has to keep you eco-criminals at WUWT from killing more children. I read it was more than 100 dead, still counting upwards. Look on my works, ye mighty, and despair! Volcanic ash and lava would do as well as sand. Breaking News ALERT!! United States Secret Service has announced that in light of the President’s upcoming trip to the region, for security purposes they will take the unprecedented move of not only ensuring all coconuts are removed from trees in India, but also removing Indonesia’s Mount Merapi, which has been releasing potential dangerous lava, ash, and gasses. An Obama official who asked to remain anonymous because he is not authorized to speak to the press, quotes Obama as stating “Cost is no issue, this is a simple matter of national security.” Hilary Clinton, on being asked about this announcement, ridiculed the idea that anyone could question this move “its just more evidence of the vast right-wing conspiracy. Claims that this will cost the equivalent of the USA’s annual GDP are vastly exaggerated” stated Ms Clinton. More information to follow as news develops. There was a report of significant activity by a couple volcanoes on the Kamchatka Peninsula about a week ago, but I haven’t seen any further coverage. Anyone heard what the present status of these volcanoes is? All My Volcanoes, which in this case happens to be worse than they thought. Volcanoes just love low Solar Activity, and are often observed throwing parties, much to the dismay of residents and computer modelers. Hey, it comes with the territory: Land is very fertile on volcanic slopes and flows, and that’s the reason you have people willing to resettle after the thing has done it’s deed. Not bad lads. I’m trying to think of one but I’m not to ignimbrite. What a stunningly foolish and ignorant statement. Could you even find Indonesia on a map? Hm. First earthquakes and tsunamis, now massive volcanic activity. Could you consider doing a post on the amount of sulfate particulates being put into the stratosphere by recent eruptions (Indonesia, Iceland, ?) vs. Pinatubo and the likelihood of effects on global climate? Dave Wendt, you can check on Kamchatka here. They (Kliuchevskoi and Shiveluch) were red for a few days a couple of weeks ago. But settled back down and were returned to orange color code. If you go to that link and type in the following years, especially since 1995, you’ll see that the numbers and total VEI of eruptions have significantly increased over what is recorded for 2 decades prior. This increase all added up means significantly more CO2, Tom. In my opinion with volcanic activity, location, water vapor content, aerosols and altitude govern what effects the plumes will have. High water vapor content significantly adds to humidity, not so much with cold oceans and lakes with lower evaporation from them. Ash aerosols at low altitude can at times actually warm the surrounding air because they absorb solar radiation such as UV and give off heat, if the plumes did not go high enough to dim out the solar radiation reaching low level. 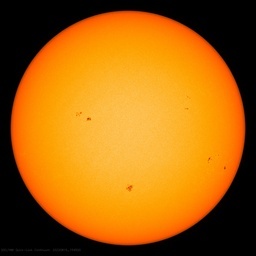 A lack of volcanic activity will increase solar brightening to the ground and oceans, also producing heat. They’re not just a wild card. Climatologist Cliff Harris writes a weekly column for The Coeur d’Alene Press. Im glad someone already mentioned the Russian volcanoes and there is one in Iceland that has its glacier pouring into it, http://www.cbc.ca/technology/story/2010/11/01/iceland-volcano-flood-grimsvotn.html , which has caused eruptions when circumstances were similar. I usually check this list http://www.volcano.si.edu/reports/usgs/ but its flaw is that it only gets updated once a week and its often incomplete . Human activity is attributed to ~6 billion tonnes of C02 emissions annually, apparently. Of that ~50% “disappears” (Well that’s what scientists tell us anyway), which is why a satellite was launched, and crashed before going operational, to find out where it went. So this ~6 billion tonnes represents the ~3% of C02 emissions attributed to human activity suggests the other ~97% from Gaia quite a bit of a bigger problem (Which we all know is a non-problem, but fossil fuels and energy use by humans can be taxed). Highlighting Indonesia/PNG and deaths over 10K is very revealing. There’s a numerical error with either Krakatau or Nevada del Ruiz or both. Tamboora is the worst, and it produced the “year without a summer”, and of course the most recent supervolcano was Toba, also in Indonesia. We can see this plate-grinding vulcanism in the very landforms of Indonesia – strung out along those great fault lines that are part of the Pacific Rim. Wht, oh what, causes this fractal focussing of patterns? Thanks for the links, saved me a lot of dumpster diving thru Google! How plausible is the Mega-Eruption scenario? Is it similar to asteroid doomsday scenarios? Also, that report is often based on estimated eruptions based on seismic data, and it is compiled expressly for impacts on aviation. Some airlines are canceling flights to Jakarta and a couple of other Indonesian cities. No big surprise I suppose. No idea just where Obama is supposedly going in Indonesia and whether this will affect his trip or not. Mega-eruptions have caused more wipe-out or near wipe-outs than asteroids. Toba brought human population down to thousands. A mega-eruption of the Deccan Traps after the large asteroid strike at the Yucatan, probably a shock wave effect of that strike, is really what wiped out the dinosaurs imo. Someone is reporting sighting a new island between Java and Bali. Might be a good item for this blog if confirmed. “The big one, as far as human evolution is concerned, was Toba, c-70,000BC. The effects of that can still be traced in the human genetic markers. One possible alternative explanation for convergence of human genetic markers at this time period would be that modern man evolved from a limited population of hominids that were trapped in a small challenging habitat that fostered rapid evolution — perhaps the original ‘Garden of Eden’ was a small island off the coast of Africa.